The pay rules for special non-working holidays like the coming Francisco Balagtas day in Bulacan is governed by Department of Labor and Employment’s Memorandum Circular 01, first crafted in 2004 under then-Secretary Patricia Sto. Tomas. According to this, employees who report for work on this day must get an additional 30% to their regular pay for the first eight hours of service provided, plus another 30% for every hour of work beyond this. Meanwhile, employees who will not go to work won’t be paid, “unless there is a favorable company policy, practice or collective bargaining agreement (CBA) granting payment of wages on special days even if unworked.” This is usually dependent on a worker’s employment status (e.g. permanent/regular/tenured employees are typically paid on these days while those whose who are still labeled as casual/probationary workers are not). PS: In the past 24 hours, I am seeing this warning in Facebook whenever I comment to my own public posts: “If your comment is irrelevant or inappropriate, you may be be blocked from commenting on public posts. Please review your comment before posting.” Weird, isn’t it? Filipinos will be having their second long weekend for 2012 next week, from April 5 to 9. Three national holidays fall during that five-day stretch. They are the following: Maundy Thursday – April 5, 2012, Good Friday – April 6, 2012, and Araw ng Kagitingan – April 9, 2012. The DOLE did not make any distinction between a contractual (casual, non-permanent) employee and a permanent (tenured, regular) one. This means that the same rule applies for all workers in the Philippines regardless of their employment status. President Aquino has announced through Proclamation 360 that Black Saturday that April 7, 2012 would be a special non-working day throughout the country. 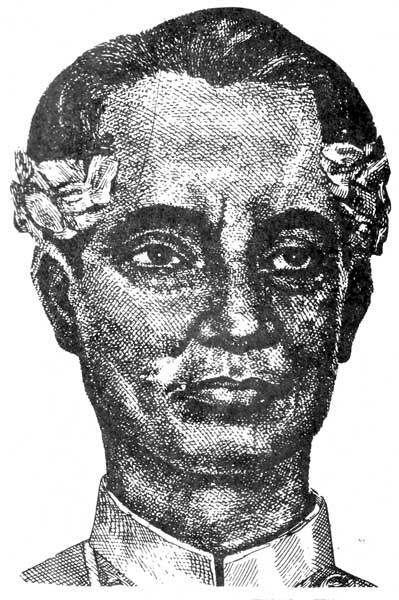 Signed last March 29, the President noted that Black Saturdays had been traditionally declared as such and that Filipunos “must be given the full and uninterrupted opportunity to ponder on the significance of the Holy Week and to properly observe its traditions with religious fervor, without prejudice to public interest.” Click here to read the entire text of Proclamation 360. Take note that Black Saturday is not included in the official list of holidays for 2012 released by the Office of the President in November 2011. Read the full text of Presidential Proclamation 295 here. Meanwhile, employers are mandated to give their employees who report for work on this day an additional 30% to their regular pay for the first eight hours of service provided, plus another 30% premium if they work beyond eight hours. PS: April 9, 2012 is the 70th anniversary of the Fall of Bataan during the World War II. Please like the Facebook page of “Notes From The Philippines”! Let me share to all readers of my blog this piece of good news. I recently won 2nd place in the recently concluded 2012 Babae Kapuso Ka ng Bayan essay writing competition. It was organized by the Philippine Center for Entrepreneurship (PCE), a group best known for their Go Negosyo initiative. The contest aims to “promote and encourage conscious awareness of the contributions of Filipino women in the different levels of society, in the different social strata, and in all fields imaginable.” Read their official contest announcement here. 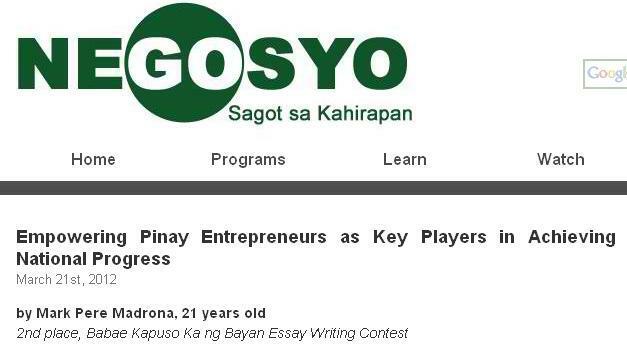 My winning entry is titled Empowering Pinay entrepreneurs as key players in achieving national progress, where I wrote that “limited access to capital and business know-show should never be allowed to be a glass ceiling for Filipina entrepreneurs.” The essay is now published in the PCE Go Negosyo website. Deofelyn Ocayo and Angelica Jazmin Cabrera won first and third place, respectively. 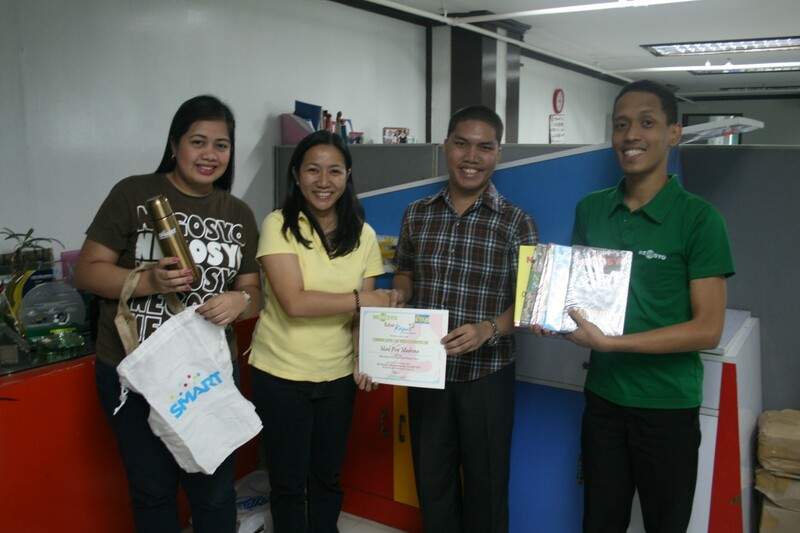 Winning participants received a certificate of recognition, a set of Go Negosyo books, among other items. The contest was open to all Filipinos, even to those based overseas. Entries were judged based on the following criteria: relevance to the theme, 50 percent; style and grammar, 20 percent; and appeal to intellect and emotion, 30 percent. Manzano is obviously being sarcastic since much of Metro Manila is currently experiencing torrential rain showers and thunder storms due to a low pressure area. An hour later, presidential spokesperson Edwin Lacierda chided Manzano for spreading “tsismis” (gossip). He explained that President Aquino is presiding over a National Economic Development Authority board meeting and that it is still ongoing by the time he made the tweet. This means that the meeting has lasted for more than five hours. 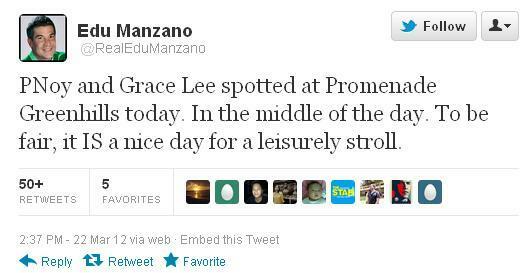 As of posting time, Manzano has not stated where he got the information about Aquino’s supposed strolling with Grace Lee. In 2010, Manzano ran as the running-mate of Lakas-Kampi-CMD standard-bearer Gilbert Teodoro. He has not indicated so far any plans regarding the 2013 midterm polls. Early this week, an article about “Noynoying” appeared in the Wall Street Journal. The act involves sitting around and staring into space. “The important thing is that you’re doing nothing,” Activist Vencer Crisostomo told the WSJ. The article mentioned Aquino’s partying with actress Valerie Concepcion at the height of Typhoon Sendong last December as proof of his hands-off leadership style. 1) I put the phone in my lap and forgot to put it back to my pocket. 2) I didn’t notice it slip out of my pocket. Because of my negligence and the driver’s apparent dishonesty (I have a strong reason to believe that he saw my phone), my beloved phone is gone forever. Losing a phone is not really a problem (unless it is an IPhone, LOL). 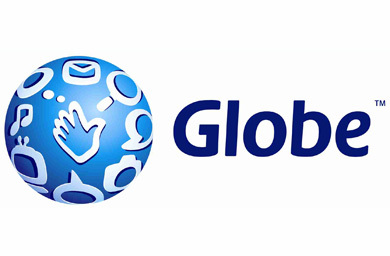 Thanks to the Globe Business Center, their subscribers can still use their old numbers! 1) Find out where the nearest Globe Business Center (GBC) is. For Quezon City residents, there’s one in UP Ayala Technohub (where I went), TriNoMa, and in Gateway Mall. Check this listing if you are living in Metro Manila. You may also call Globe hotline 730-1000. 3) You no longer need to submit a duly notarized Affidavit of Loss IF you can remember at least two numbers you dialed using your lost SIM. Luckily, I was able to list three. A lady GBC personnel provided me with an Affidavit of Loss template. I only had to write the specific details of how my phone got lost. 4) The attending GBC personnel, upon confirmation of the numbers you listed, will then insert on your phone a newly reconfigured SIM whose number now matches your lost one. Allow 30 minutes to one hour before you can begin reusing your number. MANILA, Philippines – (1st UPDATE) The Philippine Azkals made history once again after defeating Palestine, 4-3, in a thrilling game to wind up in third place in the 2012 AFC Challenge Cup Monday afternoon in Nepal. It was the Philippines’ best ever finish in the biennial tournament for developing football nations. Phil Younghusband scored two goals to raise his tournament total to six, while Angel and Juani Guirado both added to the goal-fest for the Azkals. Younghusband broke the ice in the third minute, taking a beautiful pass from team captain Chieffy Caligdong before weaving his way through three Palestinian defenders to score his fifth goal of the tournament. But after two straight shots on goal, Palestine finally broke through in the 21st minute when Abudalhamid Abuhabib struck the equalizer, which sailed past Azkals keeper Eduard Sacapaño. The Azkals were able to restore their lead just four minutes later when Caligdong was brought down inside the penalty box. Younghusband coolly delivered the penalty kick to put the Philippines ahead 2-1. Just before half time, Angel Guirado made it 3-1 for the Philippines after he evaded Palestinian keeper Ramzi Saleh and slotted the ball through. Palestine was able to close the gap when Abuhabib scored his second goal of the game in the 66th minute, but Juani Guirado restored the Azkals’ advantage with a superb strike two minutes later. Guirado received the through ball from James Younghusband and evaded the offside trap to put the Philippines ahead 4-2. Palestine was able to cut in the lead three minutes later, when a defensive lapse by the Azkals allowed Fahed Attal to score. Though Palestine attempted numerous times to go for the equalizer, the Azkals defense held. It was a historic victory for the Philippines, who missed the chance to make the Challenge Cup finals after a heartbreaking 1-2 setback against Turkmenistan in the semi-finals. They also booked impressive victories against former champions India (2-0) and Tajikistan (2-1) during the group stage. Great news for everyone working or studying in the home of balut! The municipality of Pateros will be marking its 112th foundation anniversary this March 29, 2012. Although neither President Benigno Aquino III nor Pateros Mayor Jaime “Joey” Medina have issued an official proclamation declaring the said day a holiday for this year, they are expected to do so within the next few days out of precedent. Last year, Mayor Medina signed Executive Order 2011-01 declaring March 29 a non-working holiday “for all public and private establishments located in the municipality” as part of the celebration of its 111th founding anniversary. Pateros was first declared a municipality through General Order No. 40. Act. No. 137 of the Philippine Commission. The Philippine Commission served as the country’s lawmaking body during the early years of American occupation. According to rules set by the Department of Labor and Employment, employers are mandated to give employees who report for work during special non-working days such as this an additional 30% of their regular pay for their first eight hours of service provided. The latter are entitled to get another 30% premium if they work beyond eight hours on the said day. Meanwhile, employees who choose to avail of the holiday stand to get nothing “unless there is a favorable company policy, practice or collective bargaining agreement (CBA) granting payment of wages on special days even if unworked.” This usually depends on a worker’s employment status. For example, permanent/regular/tenured employees are typically paid on these days while those whose who are still labeled as casual/probationary workers are not.